Over the past few weeks England has been getting colder and skin has been getting dryer. If you're anything like me and your skin despises the cold weather then these few products will save your skin! As the weather changes, your skin regime will too. I'm a sucker for a super hot bath but these are actually not great for your skin - especially in winter - as it can cause loss of moisture in the skin. Also the amount of water you drink has a huge effect on the quality of your skin too, so stay hydrated to keep your radiant glow all year round! My first focus when it comes to winter is my hands! They come into contact with the cold air/rain/snow a lot more than the rest of your body so I always have a hand cream with me. There are so many gorgeous hand creams around at the minute but my all time favourite has to be Clarins Hand and Nail Treatment Cream and i'm sure a lot of people would agree with me on this!! With Sesame Oil and Japanese Mulberry as it's key ingredients it is so soothing and comforting for dry/chapped hands. "The moisturizer forms an invisible protective “glove” that shields hands from the elements, keeping skin smooth and silky and minimising signs of ageing." This step shouldn't be carried out as often as the others however it is just as important! 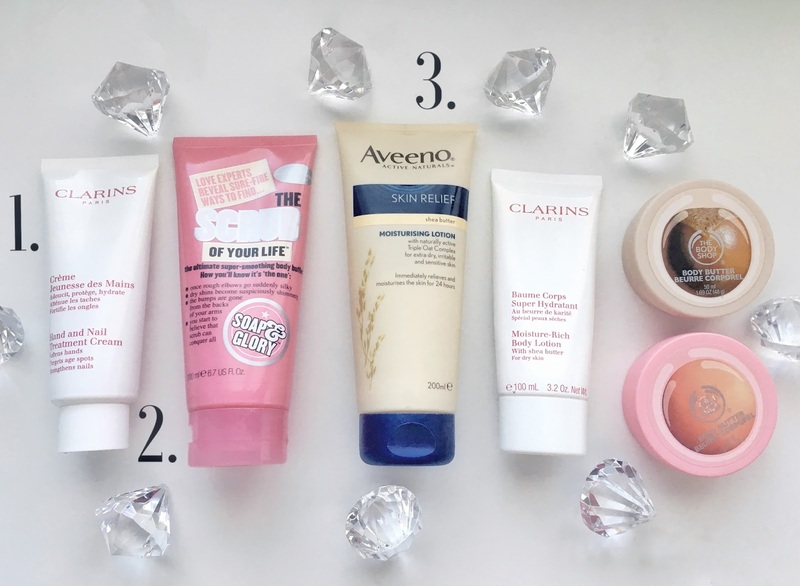 My favourite scrub for this step has to be the Soap & Glory - The Scrub Of Your Life, it has the perfect size beads for removing any dry skin without causing any irritation and leaves the skin super soft and shiny. Well this stage is obvious but i'll be honest I used to be SO lazy when it comes to moisturising until I saw the benefits!! My all time 3 favourite moisturisers for dry skin are Aveeno Skin Relief, Clarins Moisture Rich Body Lotion and Body Shop Body Butter. The Aveeno is made of Shea Butter and all natural oats so it's completely fragrance free, this is great if your skin is MEGA dry. The Clarins Body Lotion - I use this all year round! It's the perfect consistency to keep your skin hydrated and moisturised, it contains Shea Butter along with many other soothing oils. The Body Shop Body Butters are also suitable for all year round as they are lighter on the skin and also smell amazing!! I'd say they're more for normal to dry skin and are an absolute dream. What's your favourite body product?